Like the Cooper Tires Presents the USF2000 National Championship Powered by Mazda, the Star Mazda Championship Presented by Goodyear ran their second oval event of the season at the Milwaukee Mile in front of the Firestone Indy Lights and IZOD IndyCar Series team owners that are the potential future employers of the young drivers in Star Mazda. Unfortunately, and enormous downpour mid-morning on Sunday delayed the start time until after the IZOD IndyCar Series race (about 6pm local). That late start made for an extremely diminished crowd of fans. In fact, by the start of the Star Mazda race, the Milwaukee Mile was looking pretty much like a ghost town inhabited only by the zombie-like media folk who were staggering around after a VERY long weekend of racing. Team Pelfrey picked right up where they left off on the Night Before the 500 by dominating the front row with #81 Nick Andries setting the pole and #11 Connor De Phillipi starting right beside him in P2. 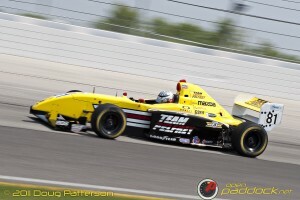 Sage Karam and the Andretti Autosport team seems to be gaining experience and pace with Star Mazda car. Sage slotted up right behind Andries in P3 and was only one tenth off of Andries’ time. Championship leader, Tristan Vautier would start on the outside of Row 2 and the next two rows would be dominated by the Juncos Racing squad. Sadly, there were only four other qualifiers for a total field of twelve cars. 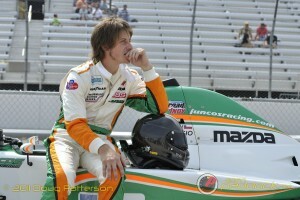 The last time the Star Mazda Championship competed at the Milwaukee Mile, in 2009, the series fielded 22 cars! While I’m not positive as to the reason for the anemic car counts of late in a traditionally strong series, I have some suspicions, but that’s a topic for another post. One notable absence from the grid was Team GDT and their driver Patrick McKenna. We’ll see if they make it to the Iowa race, but it’s not looking good, and they may be biding their time (and hoarding their funds) until the series returns to the less expensive road and street racing. As anyone in motorsports can tell you, though, good qualifying results don’t always equate to good race results. The Andretti Autosport #88 MAZDASPEED / Comfort Revolution car had a great race set-up and Sage made quick work of the two Team Pelfrey cars, taking the lead by Lap 5. Once in the lead Sage never looked back, and Andries, although with a valiant effort on the Lap 22 restart, failed to regain the lead for the remainder of the race. Andries’ teammate, Connor De Phillipi, would find himself in reverse most of the race and drifted back to finish in sixth. The biggest mover of the race was Martin Scuncio as he would finish in second after starting back in seventh. Martin would take advantage of a battle between Vautier and Juncos Racing teammate Gustavo Menezes to pass both of them and then overtake pole sitter, Nick Andries. This was Martin’s second podium of the year. Its a quick turn around for the Star Mazda crew as they’re back in action on the 7/8th-mile oval at the Iowa Speedway this coming weekend. With only twelve cars participating at Milwaukee, don’t expect a deep field. However, the cars that are in competition are extremely racy and there should be some great on-track action. 5 28 Gustavo Menezes 98 50:50.175 23.861 www.truecar.com / Truecar, Inc.